Gianpula is a night club in the limits of Rabat situated in the valley below Malta's old capital and medieval town of Mdina. Nuwavemalta is the Club which keep connected the alternative 80's New Romantics/New Wave/Post Punk/Ska/Punk/Alternative Rock/Gothic Rock/Gothic/EBM/Industrial music and events that happen in Malta and elsewhere. 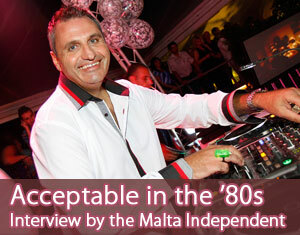 Nuwavemalta holds events and supports events that cover the same music genres. Remember The Eighties - The music of the 80s... up to date! Remember The Eighties - this is not nostalgia, this is the 80s up to date! The very latest news, interviews, reviews, tour dates, links and competitions from the bands and artists who defined the 80s, online and via our free weekly email newsletter!